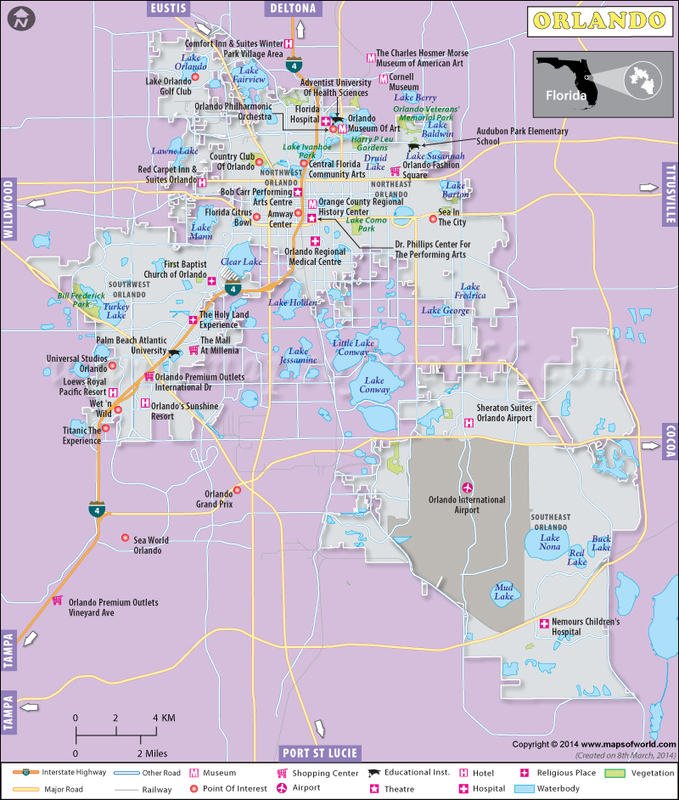 The map of Orlando shows some of the important landmarks of the city such as the shopping centers, museums, airports, theatres, hospitals, hotels, interstate highways, educational institutions, religious places, railways, roads, etc.Here you can locate some of the prominent structures or attractions of the city. It is easy to locate the Orlando Regional Medical Center on the map. Some prominent hotels and inns are also clearly marked such as Red Carpet Inn and Suites Orlando and Orlando Sunshine Resort. Some other attractions include Dr Phillips Center for the Performing Arts, First Baptist Church of Orlando, Lake Orlando Golf Club, Florida Citrus Bowl, Orlando Philharmonic Orchestra etc. Orlando is a city in the U.S state of Florida. Known as The Beautiful City, it became a popular resort during the Spanish-American War and World War I. By 1970, the city started developing and became the county seat of Orange County. It is now the largest inland city and sixth-largest overall city in Florida. Area & Location: Located at 28º32'1" North Latitude and 81º22'33" West Longitude, the city covers a total area of 101 sq. miles (261.5 sq. km) with 93.5 sq. miles (242.2 sq. km) of land and 7.5 sq. miles (19.3 sq. km) of water. The city is at an elevation of 106 ft above sea level. Around 213,233 people reside in the city with a density of 1,969 people per sq. mile. Tourist Attractions: The city is well-known for its tourist attractions. Tourism contributes much to the city's economy. Transportation: Orlando International Airport, Orlando Sanford International Airport and Orlando Executive Airport are the main airports that serve the city. Florida Central Railroad serves the city. The LYNX bus service in the city is a great relief to the passengers who travel daily. A light rail system is another means of transportation in the city. The extensive road network that includes Interstate 4, toll roads and expressway eases the traffic congestion in the city. Hotels: As the second largest city in the country for number of hotel rooms, Orlando is considered a safe place for tourists to visit. The Hard Rock Hotel, a resort hotel with a California-style restaurant called "The Kitchen" is a famous resort for tourists as well as the people living in the city. Loews Hotels, Homewood Suites Orlando Universal, Crowne Plaza Hotel Orlando Universal, The Villas of Grand Cypress, Hilton Grand Vacations Club on International Drive, Ritz-Carlton Orlando Grande Lakes, Residence Inn Orlando SeaWorld / International Center, Marriott's Cypress Harbor, Homewood Suites Orlando Universal, Hyatt Regency Orlando International Airport, JW Marriott Orlando Grande Lakes, and La Quinta Inn and the Suite Orlando Convention Center are some of the more world-class hotels in the city. Places of Attraction: Walt Disney World resort, the largest attraction in the city and arguably the world, contains the Magic Kingdom, Epcot Center, Disney Studios, Disney's Animal Kingdom, Typhoon Lagoon, Blizzard Beach, and Downtown Disney. This is a landmark of the city where both children and adults come to enjoy this spectacular magical world. Universal Orlando Resort, Sea World Orlando, Arboretum of the University of Central Florida, Blue Spring State Park, Central Florida Zoological Park, Church Street Station, Cornell Fine Arts Museum, Cypress Gardens Adventure Park (an amusement park), Discovery Cove (a resort), Gatorland, which houses thousands of alligators and crocodiles, International Trolley and Train Museum, Kennedy Space Center, The Kerouac House, Harry P. Leu Gardens, McDonald's PlayPlace, The Morse Museum of American Art, The Orlando Museum of Art, The Orlando Science Center, Wonder Works, Wekiwa Springs State Park and Wet n' Wild (a large water park) are the most exciting sights in the city.